If anyone is wondering, this is the same game I was showing off a couple of years back (original post: https://forums.tigsource.com/index.php?topic=39730.0). After the Kickstarter failed, I tried to finish off the game on my own, and ran into a bunch of problems. Some were coding and design issues, and some were life issues. I'll write a longer explanation at some point, but the short version is that I ended up starting again from scratch, so I could make exactly the game I wanted. Now, I have a completely different visual style (I'm trying to bring it closer to the previous version, but destruction and interiors are a higher priority right now), much larger environment (1 square kilometer at present), many, many more NPCs (over 36,000 in my most recent test, but I've rewritten the navigation system since then, and I'm now aiming for 100,000 NPCs), and significant extra features like destruction, an in-game editor and a few things I'll show-off as I integrate them with the main game. 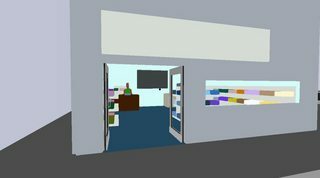 Anyway, I just wanted to say hi again, get this new devlog started, and to show a few screens off. I'll have a free demo up at some point, but if anyone wants to help me get this thing made, there's a pre-release build up on itch.io at https://adfp.itch.io/the-hit. Some shots of the new interiors. I'm writing a set of edit tools as I go, and refining the rulesets which I'll gradually build into the city generator. A few of the interaction systems are already written, so you can already pick up, drop and throw scene items, open and close doors and drawers and fire guns. Once I get the dynamic wielding system written, you'll also be able to use any item as a weapon. I've recently been able to shift my focus away from designing systems, to making the building blocks that the city will be constructed from. I'm in a place now that I've been working towards for the last two years, where I'm working with a lot less uncertainty, and without having to hold the entire game in my head while I work, constantly juggling systems and trying to iterate on and improve every subsystem. I know what I'm doing now, mostly. 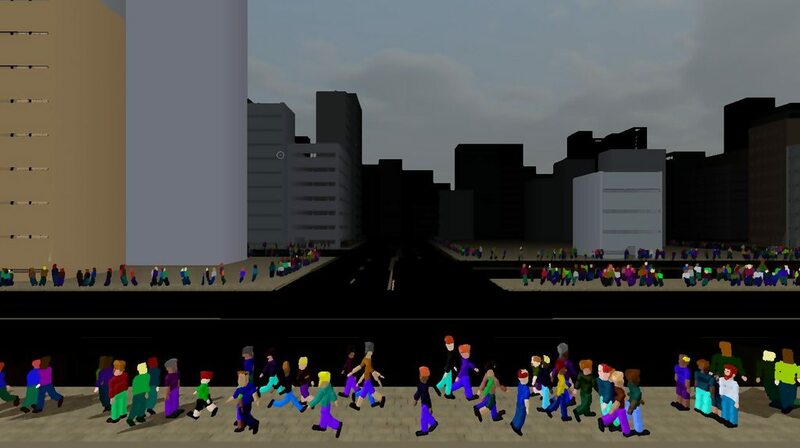 I know how all the big stuff is going to work, how 10,000+ NPCs are going to live, work, shop, play and interact in the city, how the missions are going to work, and how the story elements are going to fit together. And I've already built most of it (46,405 lines of code, and counting). 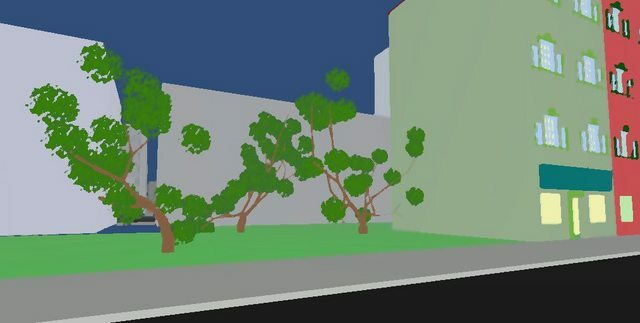 So yeah, I've had to figure an awful lot of stuff out, like how to make a basic scene object that can look and act like anything you'd physically find in a city, how to create those objects as fast as possible and modify them on-the-fly, and how the player and NPCs can interact with them in a simple, intuitive and natural way. But lately I've been working on larger elements, and creating a set of smart 'building blocks' which I can construct building interiors from, either procedurally or by hand. 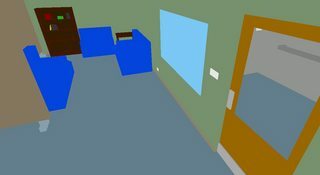 Rooms, corridors and stairwells are largely done, and systems for dynamically populating, resizing and editing scenes are also close to being done. 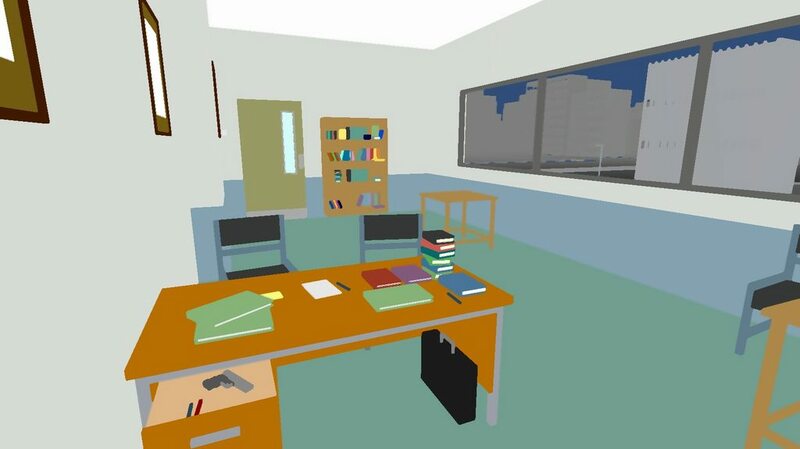 I'll be reusing these systems for the scene objects, which will open the door to dynamically adjusting values like luxuriousness, tidyness and mood, as well as enabling automatic placement of generated story elements. Basically, I'm breathing a huge sigh of relief right now. 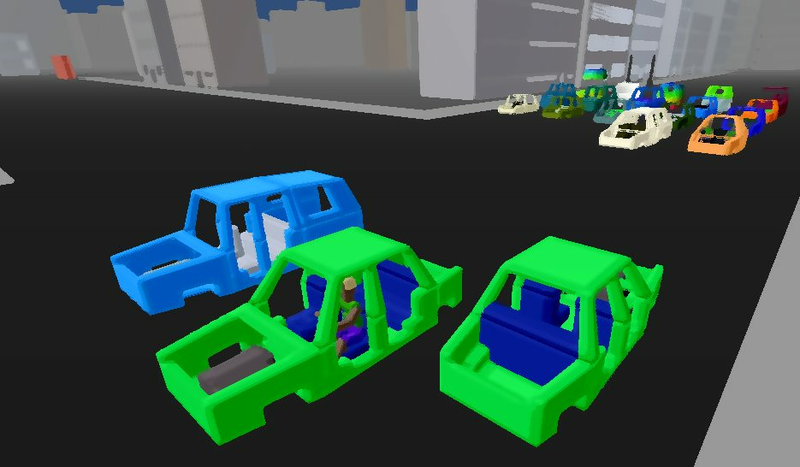 The city interiors and gameplay elemets are starting to come together, and I'm even thinking about timeframes for a possible release date, and releasing an early-access version on Steam soon. Hope to see you all in the city soon! More tools, and a bunch more utility functions written for the city generator. One of my aims with this project is to reduce the gap between having an idea for a scene and being and actually being able to experience a live, game-ready version of that scene. To that end, I've been making tools that will let me quickly sketch and edit scenes. I don't know if it'll ever be as quick as I'd like, but the less barriers there are between idea and gameplay, the better stories we'll be able to write. The other thing I've been working on lately is a new tree generator. The main aesthetic is very blocky, so it's nice to have some more natural-looking shapes to break that up. I've also been getting my utility functions in order for the next (probably final, at least for a while...) update to the character generator. Trees have helped a lot with that. I should even be able to extend the body generator to allow for all sorts of bipeds and quadrupeds, so cats and dogs just got a little closer too. Always love seeing these updates pop up twitter. Keep up the good stuff, very keen to play the full release. Keep up the good stuff, very keen to play the full release. Thanks! It's getting closer. I'm trying to figure out the fastest way I can add the core game loop. I'm even tempted to dumb it down, just so I can get the game on Steam quicker, but if I want to do it properly (and I kinda do) there's still a few more systems I need to write, and a bunch of scenes to make. I'll post absolutely everywhere as soon as I have a date. I saw the article while browsing RPS and was absolutely elated. I enjoyed following your previous devlog on TIGS and was crushed when the Kickstarter failed. I had no idea you continued to work on this. Please excuse me if I come across as overly enthusiastic but you're making the game I've dreamed of playing. Really impressed with your ambition and what you try to achieve with the project! Keep on posting good stuff! oh wow! you restarted work on it! awesome! Cool, this looks promising. 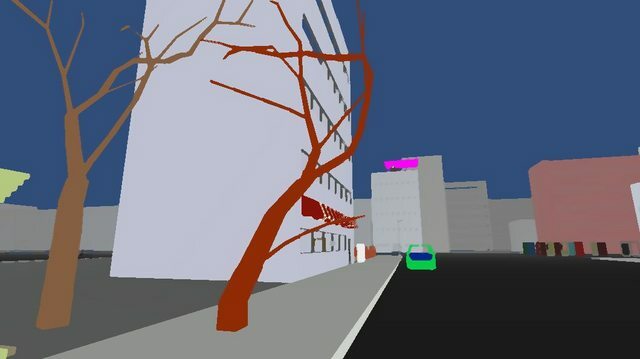 I like the look of Tokyo42 but I don't think it's procedural.. this is more exciting! 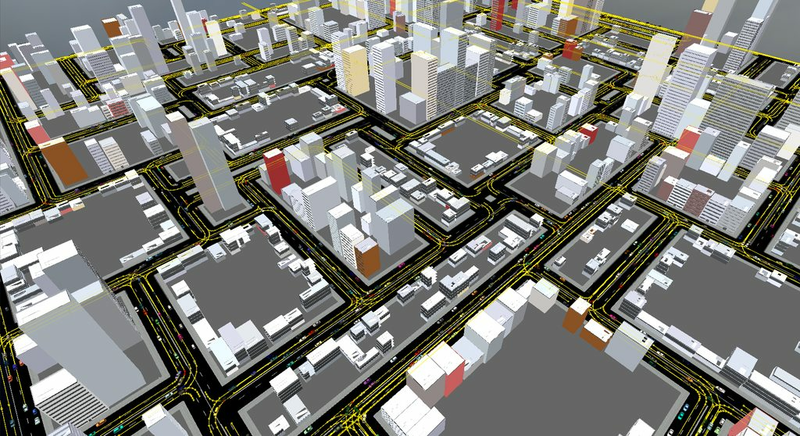 Lately I've been rewriting the city generator to use destructable voxel volumes, instead of static meshes. In my finite wisdom, I figured that, seeing as I'd be replacing a bunch of old code, it would make sense to add heightmaps at the same time. 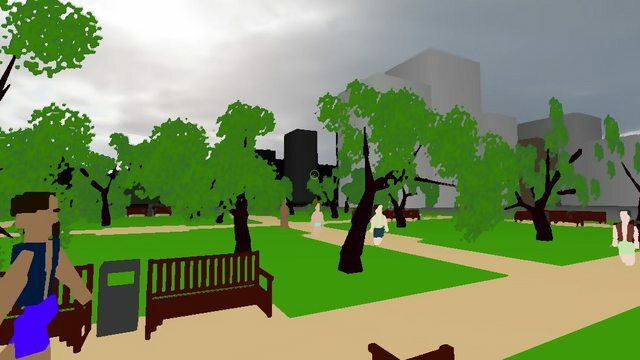 The buildings in these screenshots are placeholders (sorry, the main game won't be quite this colourful). Next step is to replace the old city block & building generators and add interiors and AI/narrative hooks. I've also been working on a new set of editor tools, which will make things easier on my end (and eventually serve as the basis for the in-game editor), but aren't as interesting to look at. Did you say destructible buildings? Or is that just to help the procedural generation? looks like an interesting project, i agree with potato, nothing wrong with colour. Thanks. I'm going to make the colours a bit more realistic for the final version. I figure the story will work a lot better if it feels like it could be happening in the real world. 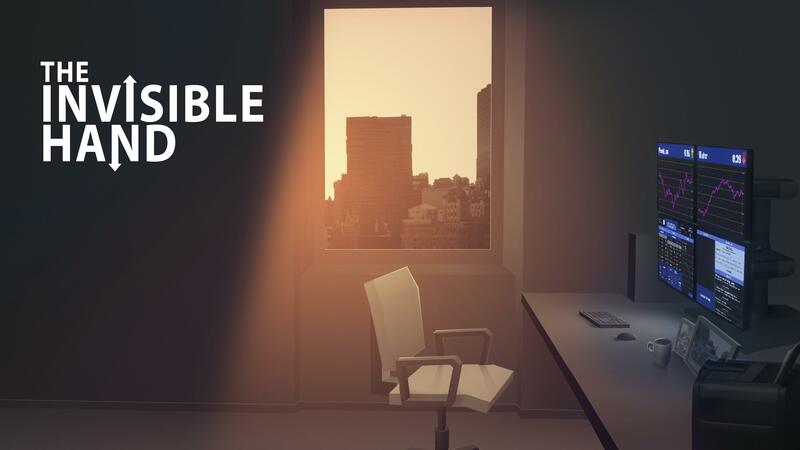 Absolutely everything will be destructable. 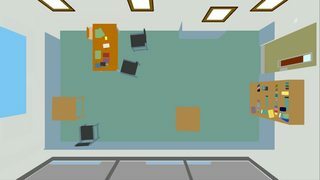 Buildings, people, furniture, even the ground. I've developed a system I'm calling voxel volumes, which are a bit like Minecraft-style voxels, except they can be any shape or size, and contain internal detail. Here's a rather graphic shot of the flesh damage, using the current NPCs (they're due one more update before launch), and an old shot of some wall damage. I'm in the middle of rewriting the city generation yet again, so destructable buildings aren't in the current build. I'll be adding them back in soon though. Wow great to see this again, would love to hear more detail about how you're thinking about the NPC routines etc. Look forward to more! A few things have changed since then, but it's still mostly accurate to what I'm doing. 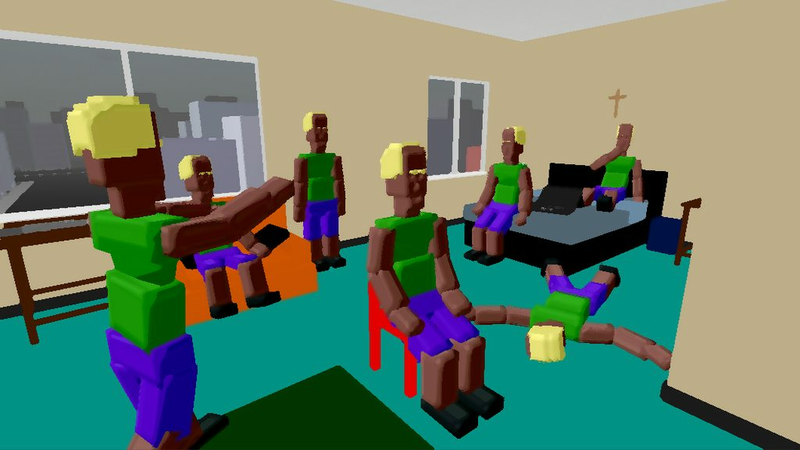 In short, NPCs will follow simple loops until the player interacts with them (which could be something as simple as following them), at which point they'll begin to acquire traits and start to become more interesting. Pre-made characters, such as assassination targets or plot-specific NPCs, will be created with some traits already in place, but could acquire more as the story develops. Thanks for the link! Sounds like a really interesting system. I've almost finished the latest set of tweaks and refinements to the city generator. The big step I've been building towards is automatic placement of voxel objects, which is so close I can almost smell it. The placement part is mostly working, but the voxel objects will have to wait til next week. The main things I've changed are the way the lots are generated, and the city meshes themselves. 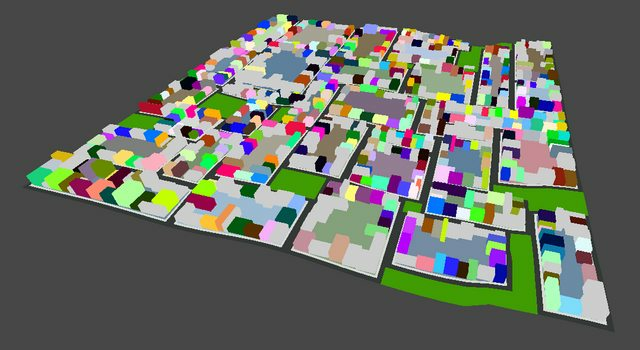 Lots are pulled from a bank of 2D, 8-colour textures, which are then analysed and the building and room geometry generated automatically. I've been meaning to sit down one afternoon and make a couple of hundred lot maps, just to add a load of variety to the city, but I keep finding more things to code. City meshes are now super-fast and super-clean, which means the framerate has rocketed, even on my laptop. I've still got some small optimisations to do, but right now I'm happy. I reckon I need to spend a few more days on the city, but then I'll be able to switch over to AI and gameplay coding, and that long-overdue new public build.